If you ask most women what the most luxurious lingerie item is, they’ll tell you a corset. One look at a high quality corset and you can instantly see the amount of care, expertise, talent and attention to detail that’s gone into crafting it – yes, even a basic one. 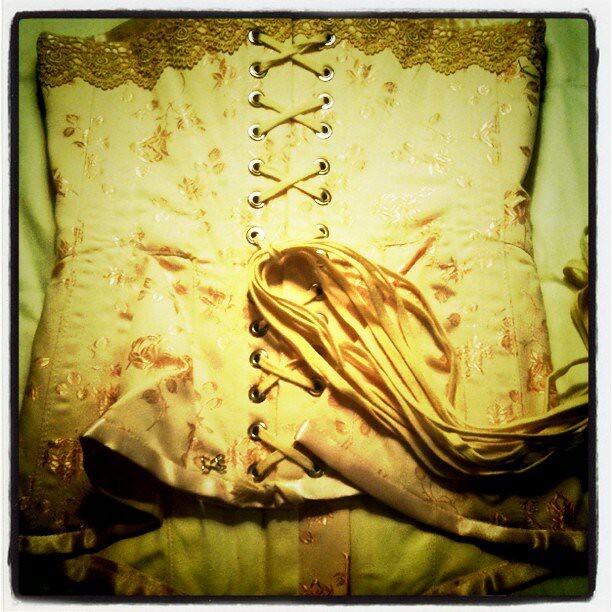 Building a corset is no easy task, and it takes a lot of time! When you’ve taken your corset off, be sure to lace it up nice and tight, and tie the loose ends into a firm bow or large knot. Leaving the lacing loose makes it more likely to catch and get pulled, perhaps when you’re reaching for something else in your lingerie drawer, and can lead to damage. There are a few options when it comes to storing your corset, but this is the one I use. I keep my corsets in my lingerie drawer along with my bras and knickers, so I need to lay it flat. To do this, unfasten the busk to avoid it getting bent out of shape. Then carefully fold the corset in half where the fabric gives most easily. Avoid ‘rolling’ the corset which can warp the bones and put extra pressure on the fabric where it gets stretched, and hence lead to a misshapen corset if it’s in storage for a while. Whether your corset is made from satin, silk, cotton or something else, just as with any fabric it’s liable to get small catches and pulls if it’s not well protected. If you’re storing your corset in a drawer, use a soft corset bag – this is a simple pouch you slip the corset into so nothing else can touch it! If you’re storing your corset in a wardrobe, pop a cover over the hanger as you would or an expensive dress. If you don’t have one, you can create a very simple makeshift cover using a strong carrier bag. Find the sturdiest plastic bag you can that’s as wide as your hanger, and cut a small hole in the centre-bottom. Then simply slip the hanger and corset inside the bag and poke the hanger’s hook through the hole! As I mentioned above, you can store your corset hanging up rather than flat in a drawer. If it has shoulder straps, simply pop it on a hanger as you would a dress or top. However, the vast majority of corsets out there are strapless so how do you hang it up? It’s simple – to avoid damage, open the busk of your corset and drape it over the hanger so that the lacing is in the middle with the two sides of the corset hanging down either side. I hope these tips have helped! Keep them in mind when you buy corsets in the future and your purchases should last you a long, long time. If you have any more tips to add, feel free to leave a comment below. Michelle Star is a fashion and lingerie blogger for www.estylingerie.com with a serious corset addiction.